Is It Dangerous to Cut Onions a Day Before Cooking Them? Preparing foods ahead of time, such as when you chop and slice vegetables the day before you need them, can save time and help you get a quick meal on the table. You might not cut your onions the day before, however, because there is a myth circulating that it's dangerous to eat onions that have been prechopped. This is just an urban legend, and you can safely cut onions the day before using them as long as you do it properly. The basis of the myth regarding the safety of onions cut the day before is based on the potential that germs or bacteria can grow on the vegetables between the time they're cut and when they're used in a recipe. It is true that onions left out in the open will eventually attract bacteria and decay, according to Dr. Ruth MacDonald, writing for BestFoodFacts.org, but this isn't likely to be a danger overnight. It's also necessary to store and handle the cut onions properly to further reduce the risk of bacterial contamination. Cutting onions the day before you need them is safe when you take the proper precautions. Always store cut onions in an air-tight container in the refrigerator because this will slow the growth of any bacteria, MacDonald notes. Storing the cut onions in a container filled with cold water can help preserve them, as well, notes Heloise, well-known provider of household tips and author of "Kitchen Hints from Heloise." Before cutting the onions, wash your hands and the counter where you plan to cut them, which will help prevent bacteria from contaminating the vegetable. The dangers of bacteria actually aren't specific to onions. Any vegetable that you cut ahead of time can grow or become contaminated by bacteria if you don't slice and store it properly. 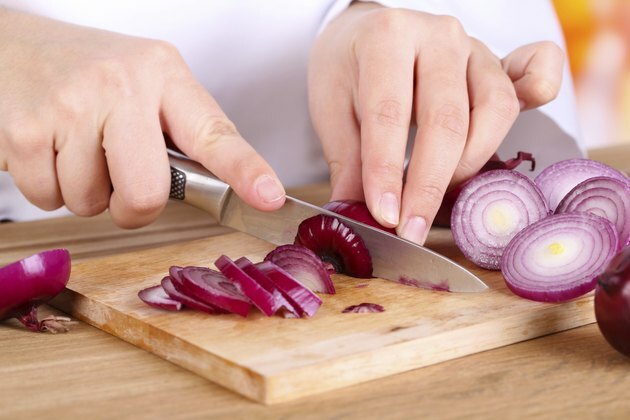 For example, if you slice your onions on a cutting board that you also used to cut raw chicken, any bacteria from the chicken juice will be transferred to the onion. Chopped or sliced onions, properly stored in the refrigerator, will keep for seven to 10 days, according to the National Onion Association. If, however, the onions are mushy or slimy or if they have a cloudy liquid around them, toss them, MacDonald cautions. Use precut onions as garnishes for burgers and sandwiches or add them to soups, stews and chili. BestFoodFacts.org: Consumer Question - Is It OK to Use Leftover Onions? Can Old Vegetables Make You Sick?